This post by Peter Lattman at the WSJ Law Blog caught my eye. It is a short review of Doug Berman's (OSU Law) "Scholarship in Action: The Power, Possibilities, and Pitfalls for Law Professor Blogs," which was originally presented as part of the symposium on legal blogging sponsored by the Berkman Center for Internet & Society at Harvard Law School. Berman, who edits the Sentencing Law & Policy Blog, does not need to be remotely defensive on the relevance of blogging to scholarship. His blog, which has garnered over 20 citations in judicial decisions (as of April 2006), has been endorsed by the President of the Federal Judges Associations and cited in testimony before the Senate Judiciary Committee (see this WSJ online story). Berman's essay is a thoughtful reflection on the purposes of legal scholarship--which, Berman observes, has become remarkably undertheorized due to a process of institutional drift over the last few decades. Berman believes that blogging is a medium that provides large synergies between the three traditional dimensions of a law professor's job: teaching, scholarship, and service. Thus, Berman concludes that blogging is destine to have an impact and may someday be "seen--along with 'serious legal scholarship'--as a preferred form of law professor activity." I agree. 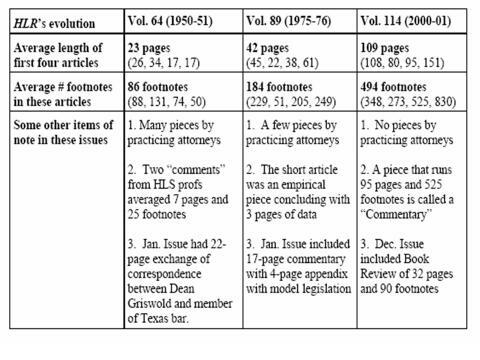 The reason that the Berman post caught my eye (and why I downloaded the paper) was a reference to statistics on the average length and number of footnotes in the Harvard Law Review in 1950, 1975, and 2000. The following chart, from page 3 of Berman's paper, speaks for itself [click on chart to enlarge].